Rationale: Complete resection of colorectal liver metastases (CLM) can be curative. However, recurrences after resection of CLM are reported in 80% (CLM) and are confined to the liver in 50% of patients. Adjuvant systemic chemotherapy did not improve overall survival (OS) in a large phase 3 trial. Adjuvant hepatic arterial infusion pump (HAIP) chemotherapy has demonstrated improvement in OS of patients with CLM in a phase 3 trial and a large propensity score analysis. HAIP chemotherapy involves continuous administration of floxuridine (FUDR) directly into the hepatic artery using a subcutaneous pump. Floxuridine has a 95% first-pass effect, which allows for a 400-fold intratumoral concentration compared to systemic administration with few systemic side effects. It is not available in the European Union but has been used for many years in Memorial Sloan Kettering Cancer Center (MSKCC) in New York (USA). 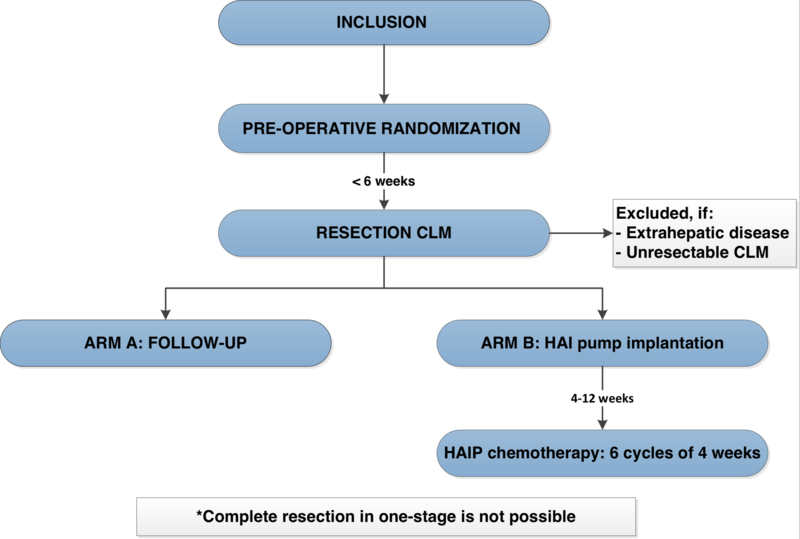 Objective: The primary objective is to compare the efficacy of surgery and adjuvant HAIP chemotherapy to surgery alone in patients with resectable colorectal liver metastases with a low clinical risk score (CRS 0-2). Secondary objectives are to compare postoperative complications, adverse events, quality of life, and costs between the two arms. Another secondary objective is to determine whether CT angiography can replace a nuclear medicine scan to rule out extrahepatic perfusion of the pump. Next, we aim to identify predictive biomarkers for the efficacy of HAIP chemotherapy and study the pharmacokinetic profile of floxuridine. Resection of CLM in both groups. Patients randomized to the intervention group receive an implantable pump placed during surgery for 6 cycles of adjuvant HAIP chemotherapy (floxuridine). Main study parameters/endpoints: The primary endpoint is progression free survival (PFS). Secondary endpoints include OS, PFS in the liver, postoperative complications, adverse events, quality of life, and cost effectiveness. Also, the accuracy of CT angiography to detect extrahepatic perfusion will be evaluated. Next, we aim to identify predictive biomarkers for the efficacy of HAIP chemotherapy. Furthermore, the pharmacokinetic profile of intra-arterial administration of floxuridine will be established.